Contact us by text at 514-613-2969 to make your service appointment. Chassé Toyota offers a full range of services to help keep your Toyota vehicle running as smoothly as possible. Come experience customer service that goes above and beyond your expectations. 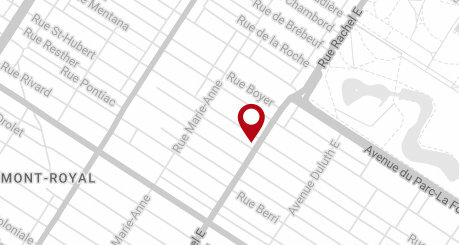 There is simply no more convenient location for you to benefit from the finest Toyota maintenance and repair in Montréal than at Chassé Toyota in the heart of the Plateau Mont-Royal! 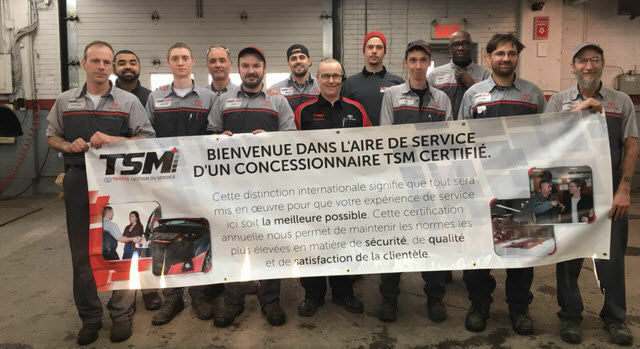 Our modern, fully equipped Montreal Toyota service centre is open from 7 a.m. every weekday and features a team of experienced, Toyota-certified advisors and technicians who know your Toyota car, SUV or truck inside and out, head to toe, top to bottom. Schedule a service appointment with us today, and on the day and time that's convenient for you, come in and relax in our WiFi-, TV- and iPad-equipped lounge, or make use of our metro Mont-Royal shuttle or loaner bicycle service for your convenience! Full maintenance and repair services for your Toyota or off-make vehicle. It’s very important to remember that at all times, it is entirely your choice to which collision centre you bring your vehicle after any accident or fender-bender. Don’t let insurance companies dictate to whom you entrust your vehicle! Following a fender-bender or accident, you want to entrust your vehicle to specialists. Our collision center and auto body professionals are manufacturer-trained and are qualified to repair your Toyota according to the carmaker's exacting standards. Contact us at 1 844 802-1967. If you are looking for a trusted dealer to service and repair your Toyota vehicle, come in today to Chassé Toyota. Located in the heart of Montreal, Chassé Toyota is always looking to stand out. At Chassé Toyota, we can help you maintain the quality and reliability of your Toyota vehicle. Our team of certified and experienced technicians know your Toyota vehicle by heart, and we know how to ensure that it retains its performance and reliability features that you love so much. We are also able to service and repair your Toyota hybrid vehicle. Chassé Toyota is equipped with 16 service bays to service your Toyota. We also offer a valet service, a shuttle to accompany you to the Mont-Royal metro station, and even a bicycle rental service. And if you prefer to wait on site, we offer you a modern waiting lounge with Wi-Fi and even iPads. To book your appointment, contact us today at Chassé Toyota at 1 866 950-6285 or by using our online contact form. Your vehicle’s tires are the only point of contact with the road, so it is essential that your tires are always in excellent condition! At Chassé Toyota, we offer you an extensive inventory of summer and winter tires offered at competitive prices. At Chassé Toyota, our tire specialists will be able to help you find the summer and winter tires that are perfectly suited to your Toyota vehicle. At Chassé Toyota, we have an extensive inventory of new summer tires for all types of vehicles including performance tires, eco-friendly tires and off-road tires. We also have an extensive inventory of high-quality winter tires to offer you. At Chassé Toyota, our experts will be able to listen to your needs to help you find the tires that will be able to preserve the safety, efficiency and comfort features you love about your Toyota, regardless of the season. We can even install and store your tires on site! To find out more about our summer and winter tires inventory in Montreal, contact us today at Chassé Toyota at 1 866 950-6285 or by using our online contact form. Make use of our conveniently located Toyota parts and accessories department in Montréal to take care of all your needs regarding Toyota products, components, accessories and performance parts. Whether you need replacement parts for a do-it-yourself project, want to customize your current vehicle to reflect your tastes or for any other parts need, Chassé Toyota’s experts are on hand to guide you properly so you can be sure of getting the right parts. We have a wide of original factory parts, can do overnight delivery for ordered parts, and offer original refurbished parts as well at very affordable prices. Take note that we use exclusively genuine Toyota parts and products in all work performed in our service department. Take a moment as well to consult our current promotions on selected parts and accessories - the savings have never been so good! If you want to restore your car to like-one condition, maximize its resale value, or simply make your driving experience that much more personalized and exceptional, count on the most professional Toyota detailing centre in Montréal and the surrounding area! 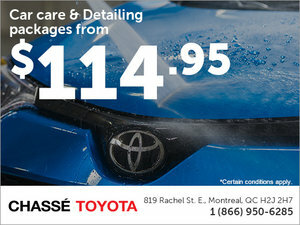 Chassé Toyota offers expert car detailing services, thanks to our state-of-the-art facilities, superior-quality products and specialized staff. Our team is experienced and benefits from in-depth knowledge of all things Toyota. Schedule an appointment in our centrally located detailing centre today, or contact us online or by phone at 1 844 367-6665 to learn more about our remarkable detailing packages.